No purchase necessary. Must be 18 years or older to win. Odds of winning the giveaway depends on the number of entries. Deadline to enter is Tuesday, February 26, 2018 at 11:59pm Eastern Time. Winner drawn at random among eligible entries and notified on Monday, March 4, 2019. By entering this contest, you agree to receive email communications from Lionsbridge FC and Planet Fitness of Hampton Roads. 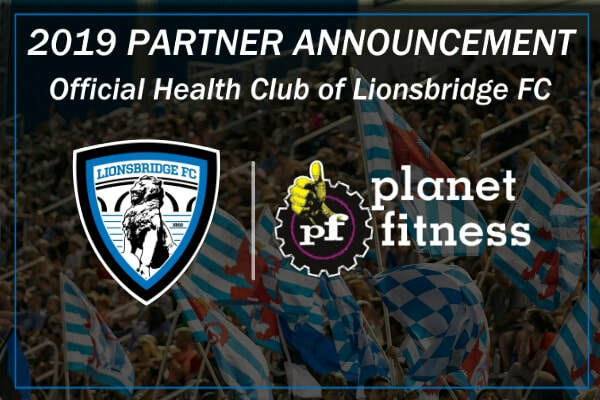 (February 5, 2019) – Lionsbridge Football Club, the Peninsula’s USL League Two team, announced a new partnership with Planet Fitness of Hampton Roads, the area’s largest network of fitness and health clubs. As part of the partnership, Planet Fitness becomes the exclusive Official Health Club of Lionsbridge FC. The club’s players, coaches and staff will have access to all of Planet Fitness’ 12 Hampton Roads locations. The Planet Fitness logo will appear on the back of the team’s home and away kits as well as the Season Ticket Jersey worn by fans to all home games. Planet Fitness joins Chick-fil-A, Riverside Health System and Financial Security Group as 2019 Lionsbridge FC jersey sponsors. “We are thrilled to welcome Planet Fitness as our newest presenting partner. Our players will be able to stay fit in a fantastic environment and enjoy the flexibility and convenience of the many Planet Fitness locations across Hampton Roads. We are equally excited that fans will have the opportunity to benefit from this new partnership as well,” Lionsbridge FC co-founder and chairman Mike Vest said. Planet Fitness and Lionsbridge FC will host an autograph session at a Hampton Roads location during the season. Additionally, new Planet Fitness members will receive tickets to a select Lionsbridge FC home game and all Lionsbridge FC ticket buyers can purchase discounted memberships from Planet Fitness. Planet Fitness will receive in-stadium activation opportunities at every home game as well as digital and social media exposure from the club throughout the year. Anticipation for Lionsbridge FC’s 2019 season has reached a fever pitch as the club’s season ticket sales have doubled compared to this time last year. Season Ticket Jerseys and Season Ticket Wristbands are on sale now via the team’s website, LionsbridgeFC.com. Group tickets (20 or more) may be purchased by calling 757-656-9659. Lionsbridge FC begin its 2019 season with the Spring Festival on April 13 at York High School. The Lions will open their season on the road before returning to Pomoco Stadium on May 22 for the first of 10 home games this summer. The festivities before every home Lionsbridge FC match at Pomoco Stadium begin at 5pm. The two-hour pre-game community festival features a beer garden, food trucks, bounce houses and other family-friendly activities. The games begin at 7pm. Select games will feature post-game fireworks. Every home Lionsbridge FC game at Pomoco Stadium will receive live, statewide television coverage from Cox Cable and stream live on the club’s Facebook page. Cox YurView is channel 11 (SD) and 1011 (HD) in Hampton Roads, 74 (SD) and 1074 (HD) in Fairfax County, 77 (SD) and 1077 (HD) in Fredericksburg, and 9 (SD) and 1009 (HD) in Roanoke. Lionsbridge FC competes in USL League Two, the top amateur men’s soccer league in North America. In 2018, Lionsbridge FC led the Eastern Conference in attendance with nearly 1,400 fans per game. Last summer, two Lionsbridge FC players signed professional contracts in England and the roster is comprised of top locally-based collegiate and international players. Home games are played at Pomoco Stadium on the campus of Christopher Newport University and televised statewide by Cox Cable. Every game is preceded by a two-hour community festival with bounce houses, family entertainment, music, beer garden and the area’s top food trucks.